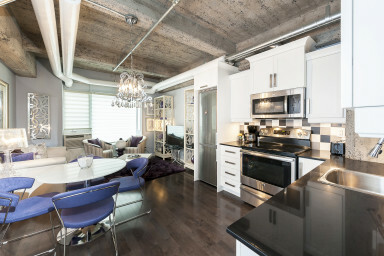 Located in Downtown near Place des Arts on Mayor Street, this 1-bed and 1-bath loft-style condo is 595 sq. ft. and features large fenestration, exposed concrete, high ceilings, and hardwood flooring throughout. Amenities include mounted air-conditioning, unlimited high-speed Wi-Fi, free local calling, and on-site fitness room. Style and comfort await you in this fully-furnished 1-bedroom at Place des Arts. Enjoy open-concept living with a sunny den area, complete with beautiful views of the interior courtyard garden, comfy sofas and surround sound flat-screen television. The modern kitchen comes fully-stocked with stainless-steel appliances, fitted cabinetry, as well as cookware and utensils; and a 4-person dining table means you can easily entertain friends and family or enjoy a quiet dinner at home. The semi-closed bedroom offers a queen-size bed and large closets, while the designer bathroom features elegant above-counter sink vanity and large walk-in shower with sleek tiling. Unit #804 also includes laundry closet with high-end washer/dryer for your added convenience. Simplissimmo means simply living well! Completed in 2013, the ten-storey RYTHME Condos boasts a total of 97 residential units with high-quality design and soundproofing, combining industrial charm with modern finish. Building amenities include lobby entrance, interior courtyard garden, and a well-equipped shared fitness room. Located in the heart of Downtown, in what’s known as the Quartier des Spectacles, this neighborhood is one of the liveliest in the city. Thanks to a close proximity to just about everything, and conveniently placed by the Place des Arts metro station, this address puts you in a true walker’s paradise. Parc Avenue offers plenty of everyday conveniences and services, or head over to the Complexe Desjardins for loads of name-brand shopping. Wander around the Place des Festival and the illustrious Place des Arts, ground zero for many of Montreal’s biggest festivals including the International Jazz Festival and Just for Laughs among others, and also along the famous St-Catherine Street is where you’ll find a plethora of designer boutiques, stores and restaurants of all kinds. In the evening, places like Benelux, Pullman or Furco are excellent choices for some classy drinks and nibbles, or head into nearby Chinatown and Old Montreal for some real nightlife. The best of Montreal at your doorstep!